You’re probably already quite familiar with the Fourth Circuit’s 1997 in Zeran v. AOL. 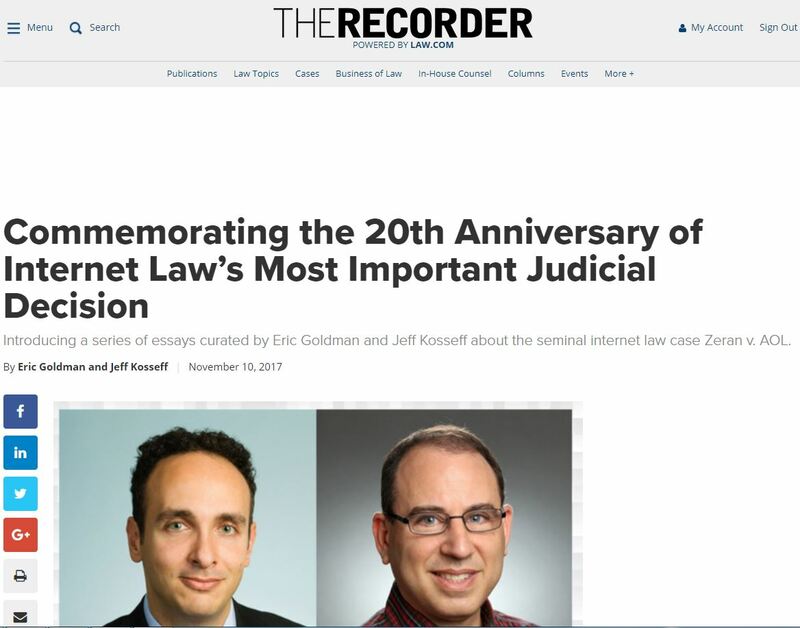 The case is one of the most cited Internet Law cases of all time, and it is a staple of Internet Law course syllabi around the country and the globe. To me, Section 230 and the Zeran ruling are equally essential; we don’t really get the full impact of Section 230’s immunity without Zeran’s broad statutory interpretation. For that reason, I (and others) attribute much of the Internet’s success to Zeran’s long shadow. 1) Historical perspectives, including Berman, Brill, Butler, Carome/Glynn, Goldman, Kosseff, Nelon, and Sutter. 2) Section 230 fans, including Cohn/Williams, Gellis, Heymann, Jain, and Zittrain (he might be classified as a not-fan, depending on your perspective). 3) Section 230 not-fans, including Bartow, Franks, Schwabach, and Sylvain. Note: while I don’t agree with these essays, we didn’t impose an ideological standard for inclusion into the package. We can’t fully understand the Zeran case without examining it from all angles. 4) Doctrinal implications of the case, including Ballon, Ford, Frye, Grimmelmann, Penney, and Speth. * Jerry Berman shines a spotlight on how the long-forgotten “Interactive Working Group” helped shape Section 230 during Congress’ chaos in 1995. * Hillary Brill talks about her firsthand experience as eBay in-house counsel trying to defend an eBay executive from a prosecution in India, where Section 230 wasn’t applicable. * Pat Carome represented AOL in the litigation. 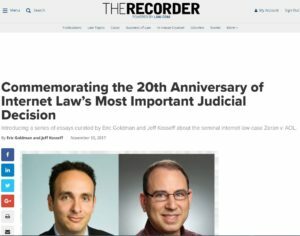 His essay with Cary Glynn (who did some great guest-blogging here on SESTA) talks about the fortuitous set of circumstances that contributed both to the favorable ruling and to its speed. This is by far the longest essay in the package, but if you read only one essay, this is it. * Gavin Sutter compared/contrasted the divergent development of US and UK law. As the maxim goes, read the whole thing. I hope you enjoy reading the essays as much as I did.